Every camera inside Canadian Tire Centre on Tuesday morning was trained on Ottawa Senators assistant coach Martin Raymond. The media contingent – in numbers that resembled a playoff game rather than a November home date against New Jersey – was analyzing Raymond’s interactions with Senators players during the morning skate. As the session wrapped up, Raymond had an extended conversation at centre ice with Matt Duchene, who was seen laughing at one point during the chat. That is significant because Duchene was a central figure in an Uber dash-cam video released publicly Monday that featured multiple Senators players mocking Raymond’s coaching style and techniques. 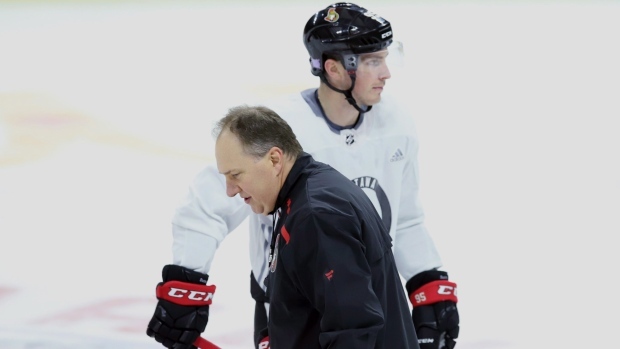 None of the players who appeared in that video – Duchene, Chris Wideman, Thomas Chabot, Colin White, Alex Formenton, Dylan DeMelo and Chris Tierney – were made available to the media on Tuesday morning. But those Sens players who did speak on their behalf were not happy with how the story of their teammates criticizing an assistant coach became public. “It’s unfortunate that someone decides its right to record that. And then someone finds it newsworthy and posts it. It’s a private conversation. It’s disappointing. You’d expect something like that from TMZ, not Ottawa,” centre Zack Smith said. Head coach Guy Boucher had to contain his anger over what happened to Raymond when the topic was broached during his pre-game media availability. Behind the scenes, the seven players and organization are livid and questioning the ethics and legality of how the embarrassing video was released. It’s believed the Uber driver uploaded the video on YouTube at some point last week, but it hardly received any attention. There were fewer than 50 views on the video — likely because there was no mention of the Sens or the players in the description. It was merely a bunch of random numbers, so it wouldn’t have been easy to find through a standard search. But then on the weekend the Uber driver went on Twitter and tweeted out a link to the video at multiple members of the Ottawa media who cover the Sens. In one of the tweets he sent to an Ottawa reporter he wrote, “your Senators have a problem. Cheap entitled kids.” It included a link to his dash-cam video. The driver didn’t appear to ask for any compensation for the video in his tweets to Ottawa media. The tweets have since been deleted. By Sunday, Postmedia was in possession of the video and contacted the Senators to authenticate its veracity. The team declined to comment but put the wheels in motion to try and get ahead of the story if the video saw the light of day. A copy of the video was sent to the entire team by the management. The Senators contacted Uber on Sunday and had the driver remove the video – which still only had about 50 views on YouTube. It was when Postmedia released a copy of it on its platform Monday night that the story exploded. The Senators players and staff had a meeting at some point on Sunday and it’s worth noting there was a players-only meeting following the 4-3 overtime loss to Tampa Bay that night. While the public only found out about the story on Monday evening, the Senators organization had already had at least 24 hours to digest the news. At that point, the club felt the matter had been resolved internally. Last year, a number of internal stories seemed to spiral out of control and were not addressed in appropriate manner. This time around, the staff and players were trying to get out in front of controversy. “The minute we knew about it we told ourselves this year we were going to be quick on it. And we were very quick on it. This was dealt with days ago,” Boucher said. The players echoed that sentiment, claiming the weekend meeting about the video was handled in to their satisfaction. “As soon as it came to our knowledge we addressed it right away. We knew about this well before it went public. We discussed it internally and we took care of it,” veteran netminder Craig Anderson said. The Senators have been dogged by controversies and negative storylines for the better part of 2018. The last few weeks have been relatively controversy-free, but this latest story is yet another unwanted headache for the organization. Some of the players admitted this whole incident was a necessary reminder about the dangers of social media and the pitfalls of being high-profile athletes.